In my last post about discussing how to interpret short interest, I concluded that betting against the market when it has a high short interest in a stock is unwise. It’s perhaps ironic then that the next stock I wish to write up on my blog is a company with 35% of the float short. The company is Ubiquiti ($UBNT), a fast growing network hardware producer. Normally when it comes to hardware and technology, margins and returns on investment are low, but Ubiquiti has managed to dominate its market with a unique approach to the business, one that is not easily replicated. Before going into the specifics, I will address the short interest specifically. Firstly the company has a majority owner, its CEO and chairman Robert Pera, owning around 65% of the company. This reduces the float and makes short interest seem absurdly high. In reality there are 9.6m shares short out of total shares outstanding of just under 90m. So still a substantial amount but not quite as high as at first glance. Secondly, the majority of analysts rate the stock as a strong buy, so it doesn’t appear to be the market as a whole is pessimistic about this stock. Despite searching, I have yet to find a short thesis on UBNT, which considering the size of the aggregate short position is unusual. At the moment the reason is still a mystery to me, but this short interest is clearly why the shares trade around $29, near their 52 week lows (range $27-$57). It is also attractive on a forward P/E basis compared to historical valuations. The striking difference of UBNT to its network hardware competitors is its sales and marketing, which is pretty much non-existent. In 2014 sales, general and administrative expense was just 7% of revenue, which gives them consistent net profit margins over 25%. Compare this to other hardware companies like Cisco ($CSCO) that spend 24% on sales & admin and still have desirable net profit margins above 15% and you can see that UBNT is doing something right. Moreover, because they spend nothing on advertising, it makes it all the more clear that their products are better and cheaper than the competition. All their products are sold mainly through word of mouth and viral marketing by existing customers. Such a strategy relies entirely on your products, how well they work and their cost effectiveness. It also uses its customers to provide tech support via its online forums, reducing admin expenses even further. Users also help developers as they are developing new products, testing updates and improvements to the software that comes along with UBNT’s hardware, allowing them to create new and well integrated systems that directly address customer requirements. Because of the expense-light model UBNT can afford to sell products as much as 75% cheaper than their competitors and still make money. UBNT also has little manufacturing facilities itself, instead contracting other manufacturers, mainly in China, to assemble its products. This means that capital expenditure on expanding production is pretty much non-existent and sales can increase quickly with little cash investment necessary. As with most technology hardware companies, UBNT requires some work by an average investor to merely understand their products and the competitive standing. It is doubtful you can really understand how the products work or how open they are to being surpassed by new technology, but this is the same for most tech companies, even ones like Apple that we are so familiar with. Here is the UBNT product range. 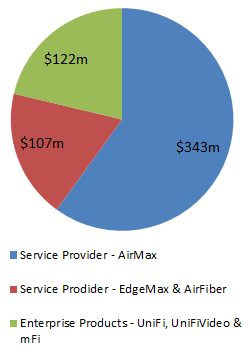 UBNT doesn’t give a sales breakdown by product, just by segment, but here is the best estimate I have found, the main point being AirMax accounts for the majority of sales. UBNT’s products are focused around wireless technology. Currently a lot of the Western world is served by physical cables for internet access which provides fast, reliable service. However this is expensive to install and while it makes sense for densely populated areas, more remote locations do not yield attractive returns on investment for Internet Service Providers (ISPs). This is where wireless technology steps in, particularly in the developing world where a lot of communities are rural. Wireless roll out is simpler and cheaper, and now that the technology has advanced, it provides an acceptable, fast service to customers (note that I am talking about how ISPs get data throughout the network as a whole, not whether the end user has wireless or wired). You don’t need to be too informed on the industry to know this is a huge growth sector, particularly in developing countries. 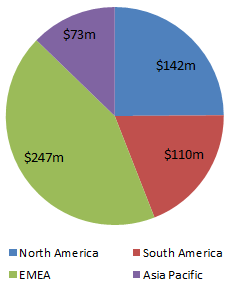 This is why revenue is mostly from outside the USA. AirMax has existed for around twice as long as the other products, which explains its dominance in sales. But the growth in the Enterprise Products segment is already far outstripping the growth in Service Provider and should be expected to continue. Here is a brief overview of UBNT’s products, who they are targeted at, and how long they have been on the market. Direct sales are almost all to distributors but the end customers differ for each product. AirMax Launched 2009 Companies – wireless internet service providers (WISPs), whose network relies on wireless transmission rather than physical cables like a lot of western ISPs. Sales page – cheaper and easier internet using wireless, now almost as fast and reliable as physical cables, can travel up to 50km. AirMax is the market leader in supplying the WISP industry. EdgeMax Launched 2012 ISPs, but also available to consumers directly EdgeMax are a range of wireless routers for peoples homes. They are among the fastest and most reliable in the industry. AirFiber Launched 2012 Consumers & WISPs Purpose built for outdoor wireless, for only $1,000 can travel up to 100km. Currently so innovative there is no competition. UniFi Launched 2011 Enterprises – that want a fast reliable Wireless Local Area Network (WLAN) for offices/customers Cheap WLAN – at well under $100 for a unit, is 20-30% of the price of competitors. Is also attractive to consumers. 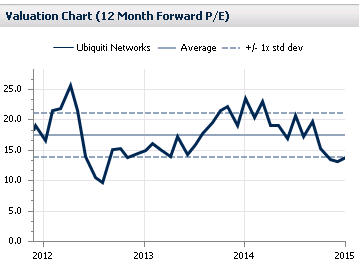 Pera predicted that Unifi may become #1 in its industry by the end of 2014, passing Cisco. He also predicted that Unifi will pass Airmax in revenue within a few years. Robert Pera is an ex-Apple employee who started this company from nothing, and didn’t use millions of $ in venture capital to do it either. I think that speaks volumes about why UBNT is so low cost. Here is his Wiki page which is interesting, I will just highlight a quote from a conference call that I think demonstrates why I like him. 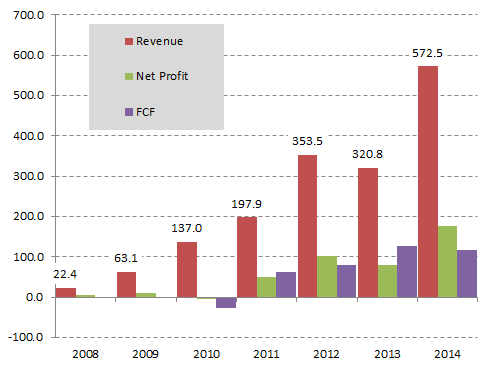 UBNT’s revenue growth speaks for itself, the only blip being a sharp decline in 2013 due to counterfeits hitting the market due to inadequate legal protection of their products and brand names. Luckily these legal issues have been resolved by actually hiring a legal team for the first time (this company takes saving on expenses to the extreme, but not when hiring staff which they pay well to get the best and keep them). Revenue growth has compounded at 42% per year in the last 3 years, and analysts expect growth to continue at around 25% per annum. Free cash generation is strong, averaging 95% of reported net profit in the last 4 years. Capital expenditure is very low at around $4-5m (on profits of $177m) so this business is extremely cash generative. At the moment that cash has not been repatriated and a pile sits on the balance sheet. For a company growing revenue at 40% a year, such a low multiple of earnings is almost unheard of. So why could that be? Technology risk: tech companies are always higher risk than consumer goods like Coca Cola. Seeing what this industry looks like in 5-10 years is difficult even with expert knowledge, so amateur investors quite honestly have no hope. Disruptive technology is the biggest risk, back in 2000 we all remember how popular Nokia mobiles were, and who had heard of Apple (outside those into computers obviously)? Tech brains like Elon Musk have already spoken of launching satellites to beam down wireless internet, it just shows how this technology can rapidly change. There is no way to mitigate this beyond sensible position sizes and diversification. Bundled offers: Currently a business may wish to set up a Wireless Network but integrated with a wired network. As UBNT does not supply wired hardware, there is a risk that current network providers start to offer a wired bundle including wireless for free, or even configure their systems so that the wired hardware and software is incompatible with anything other than their own wireless products. Such a move could have a substantial impact on UBNT sales. Reliance on Ubiquiti Community: Having no sales force is one of UBNT’s greatest strengths in my opinion, but it is also a weakness. If its products are overtaken by new technological developments then a sales force could mitigate this by finding willing customers, who may be unaware of rival products. Without a sales force, and with a community that is by definition clued up on the industry and competition, sales could quickly dry up if better products are available. Any fall from grace is likely to be rapid, which may explain the share price’s high volatility as quarterly sales declines are met with investor fear of ‘the end’ being in sight. Theft of Intellectual Property: The company has already had to deal with counterfeit products dramatically reducing sales in 2013, these problems seem to have been resolved but could happen again in the future. The fact that they hire third party manufacturers in China heightens the risk that they will also create extra produce for the counterfeit market. New products: UBNT currently earns high margins on its flagship product AirMax, but new products such as UniFi may not be as profitable, or even profitable at all. UBNT doesn’t disclose margins for individual products. Products rely on unlicensed spectrum: Certain frequencies of electro-magnetic waves are licensed and some are not. Licensed obviously costs money but also means someone controls the amount of traffic in that frequency. Because UBNT use unlicensed frequencies, it has no control over what other devices uses it alongside them, and the more traffic there is, the more ‘noise’ is created which makes it harder for UBNT products to distinguish between the waves they want to receive and those they want to ignore. As more and more wireless devices are used in the world this ‘noise’ will only get worse. UBNT develops products that address these problems better than others, which is why they perform better, but it needs to keep developing better and better solutions to stay competitive. Ubiquiti is one of only a few technology companies that I think have a durable competitive advantage that are also selling at a reasonable price. Their products are clearly some of the best in the industry, and they compete well below the price of competitor products yet still earn greater profit margins. I do not see how another company can easily replicate this success, given that the products are already so cheap and I don’t see why the Ubiquiti community would want to switch to another brand’s product that does the same thing but without the established community already in place. I have obviously not gone into detail on the technological component of the products here, and that’s for a couple of reasons. Firstly it is too complex to fit in a single post. Secondly, I am in no position to give such an explanation, being an investor rather than an engineer. Still, from what I have researched, I am very attracted to an investment in this company. ← What does Short Interest tell you? Excellent thanks, I was hoping someone would share a short thesis. Hello. Could you specify closer what you consider the competitive advantages here? It is a very interesting and compelling idea, but given the short history I believe it is hard to see if they really have sustainable competitive advantages. The technology risk scares me, what stops bigger competitors from developing as cheap and/or better products? I think the competitive advantage is their lack of a sales force. There are already competitors like Cisco making arguably better products but they are more expensive in part due to the large cost of their sales force. UBNT are targeting the lower cost end of the market, but at their current price point there isn’t that much price sensitivity, so a competitor could undercut them on price but users would more likely choose the better product. Of course someone could come out with a cheaper and better product, just like UBNT did years ago, but I think that is the same with any tech company so it depends whether you feel comfortable living with that risk or not. Yeah and also the close cooperation with customers might give them better relations, faster time-to-market, and adapting the products to the customers in a direct way. It is an enticing business model, but I can’t decide how big the competitive advantage really seems to be. The geographical diversification in nice, if one region/market starts getting more competitive it will probably take a while until it spreads and the profits are hit real bad, giving an investor time to exit. There’s a bunch of write-ups on Seeking Alpha, too.